Big showy hydrangeas come in so many shades of blue. From the soft Blue Enchantress to the deep cobalt blue varieties you find in the gardens of the North West United States. 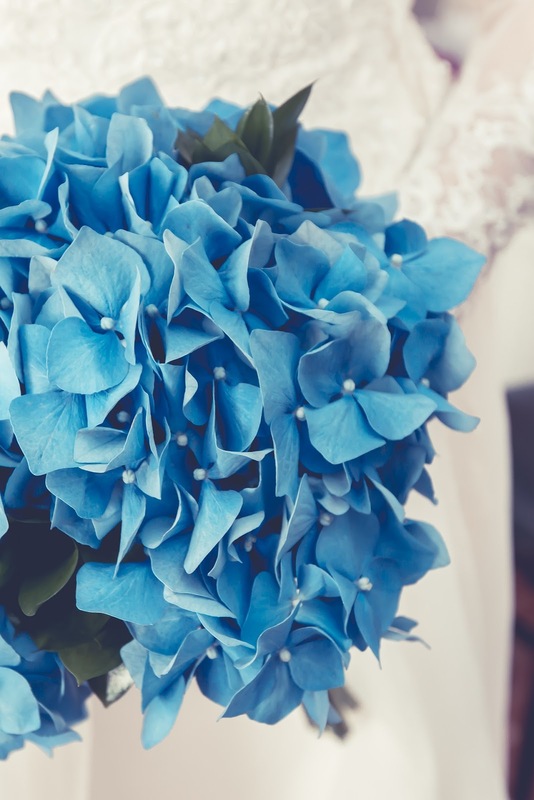 Hydrangeas come in such a multitude of hues they work well with any blue wedding theme. In this post you will see a variety of different romantic blue hydrangea designed wedding invitations. These outstanding designs are exclusively found on Zazzle.com. The invitations you find here can be personalized to suit your wedding style from casual to formal. 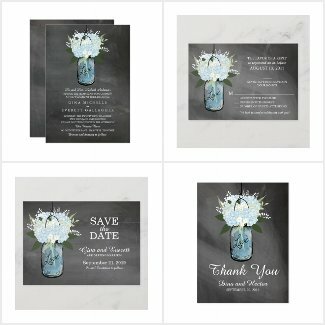 I chose Zazzle.com because of the large variety of paper qualities you can choose from. There are six paper shapes and a total of 12 paper types for budget to the most formal presentation. 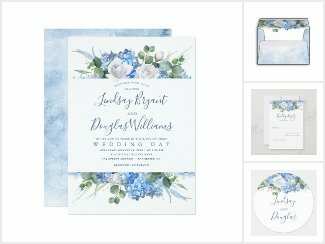 The first invitation we will feature is entitled the Hydrangea and Greenery Dusty Blue Hydrangea Invitation. The florals include French blue hydrangeas, white romantic roses and soft green eucalyptus leaves. The back of the invite includes a complimentary blue watercolor wash. This design has included matching wedding and even bridal shower pieces to create a lovely suit for you to choose from. This next offering uses more of the watercolor wash idea with light blue hydrangeas, ivory and blush roses and both light and dark colored foliage for accents. Using a complimentary darker blue background really makes this blue hydrangea wedding invitations pop. You will find this design is part of a wedding suite. The last lovely suggestion is a trendy gray background with pretty blue hydrangeas in a clear mason jar. 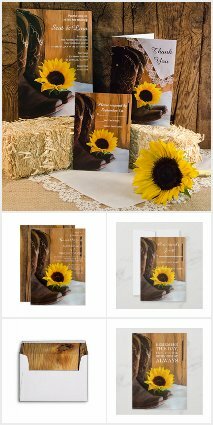 The rustic wedding design and simple text makes the entire suite is a winner. Zazzle always is having a sale. Many days the discounts includes paper products such as invitations, save the date cards and specialty envelopes. Visit the Zazzle Coupon Codes page to see how you can save on your order. Add vintage to your wedding event with romantic botanical flowers including soft colors and plenty of greenery. When we think of flower arrangements for our weddings we can hear the cha ching of our event's budgets climbing higher. However, there are some simple ways to save on the flower budget for your wedding. In this brief blog post I'll tell you some great ways to save on your wedding flowers that are easy to follow. Before sitting down with your florist know how much you have to spend on flowers. Be honest with the floral expert and they will be able to give you the best advice on what kind of flowers you can afford. If you are choosing local flowers you will not only save money on transit, but will have the freshest blooms to choose from. Better yet, choose flowers that are in season and local. Your florist will know and understand and can suggest options. Your florist is an expert, if they suggest cost cutting flowers you would hesitate to choose readily hear them out. They may show you varieties of flowers in the same floral family that will not be familiar to you. Keep an open mind and ask for examples. The fewer types of flowers and foliage the cheaper it should cost. If the florist is using two different stems (flowers or foliage) instead of six, the cost of the flowers and labor should decrease. Keep the arrangement full and simple to get the more bang for your buck. Those bridesmaids bouquets can be used to add color to the cake table or guestbook table. The aisle decorations from the wedding venue can be used at the bride and groom's table at the reception. Be creative and use floral arrangements in various places for each event of your wedding. One very easy way to create an expectation of what your wedding theme will be for your invited guests is the wedding stationary you will use. 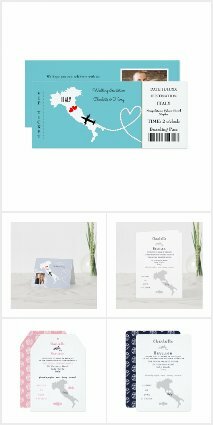 There is no need to have to spend thousands of dollars on your wedding save the date cards, invitations and other paper wedding needs. My Vintage Peonies Botanical Wedding set will help you along the way to presenting your romanic botanical wedding in the best possible light. I started this botanical wedding set with a soft and fresh spring green. 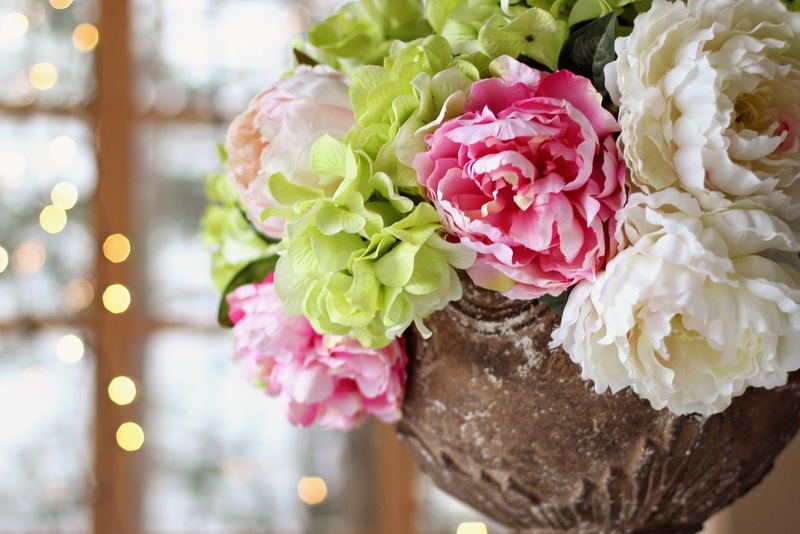 The flowers are alabaster peonies with a hint of blush pink. 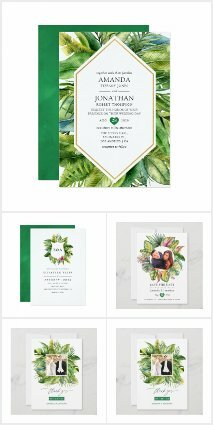 Matching buds and green foliage enhances these stylish but casual wedding paper products. There also includes a gold edged area where you'll see elegant hand lettering and easy to read fonts used in an elegant black. As always all the text you see can be personalized to meet your wedding needs. Don't forget to save even more money by visiting Zazzzle's Coupon Page. Their discounts change often and you may find yourself saving even more money by visiting. Feel free to leave comments regarding your experience with florists. Add questions regarding the Vintage Peonies Botanical Wedding set too!